It snowed last night here in St. Louis. As I write, there are still flurries, and the overnight forecast is for 10 degrees. Brrrr! Weather like this makes me crave stick-to-your ribs fare. And in that category, there’s little more satisfying than a hearty bean- or legume-based soup. Some soup ingredients that are good anytime — but particularly appropriate for the New Year – are black-eyed peas and collard greens. We’re only a few days into January, so this discussion seems timely. In the South, Hoppin’ John (black-eyed peas and rice) is a traditional New Year’s dish. 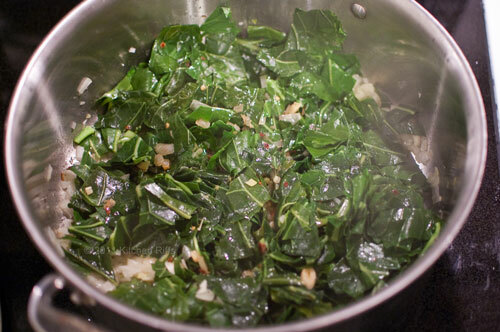 Cooked collard greens are often served as an accompaniment. Popular wisdom has it that Hoppin’ John represents good luck and collard greens mean good fortune (some say the green leaves represent “folding money”). Well, I can use good luck and good fortune any time, so why not combine the two in one dish? 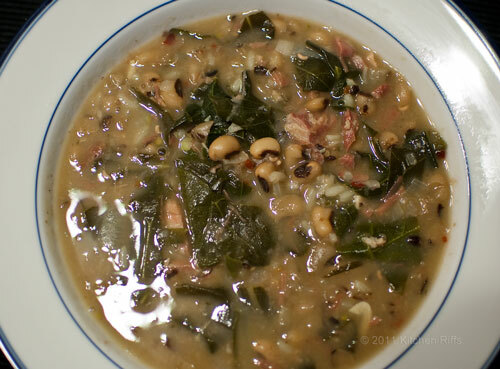 Black-Eyed Pea and Collard Green soup fits the bill. I don’t know what took me so long to discover this soup. I knew about black-eyed peas from the days my wife and I lived in Dallas. Texans love black-eyed peas – they are even an ingredient in a dish called “Texas caviar.” Black-eyed peas vie with pinto beans as the state’s favorite legume (though I’d have to give pintos the nod here). I’ve used black-eyed peas in numerous recipes — including, of course, Hoppin’ John. I was also familiar with collard greens, though I used them less in my kitchen. The traditional collard green recipe calls for slow-cooking them with smoked pork (usually salt pork or ham hocks) in lots of liquid (which becomes the wonderful “pot-likker” that often accompanies the cooked greens). This is a good recipe, and the long cooking minimizes any bitterness or toughness the collards may have. But I’ve always found that long cooking leaves the greens with a somewhat muddy taste, so this dish has never been a staple for me. Nowadays I prefer to cook collards – or almost any dark, leafy green – either sautéed or braised with garlic and/or onions and red pepper flakes (similar to Italian recipes for broccoli rabe). Cooked this way, you lose the pot-likker, but your greens keep a lot more of their flavor. Anyway, even though I’ve had Hoppin’ John and collard greens on my plate simultaneously many times, the idea of combining them in a single dish never occurred to me until a few years ago. My inspiration was Cuban collard green soup, a dish I sampled when my wife and I lived in Tampa. There are many Cuban restaurants in Tampa, and this soup was one of our favorite menu items at the one we frequented. The Cuban soup has white beans (navy or great northern) cooked in a pork broth with potatoes and collard greens. 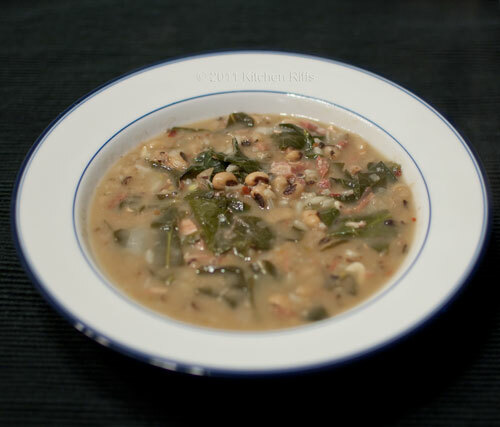 While eating this soup one December day, it occurred to me how easy it would be to substitute black-eyed peas for the white beans and rice for the potatoes, and turn it into a Hoppin’ John and collard green soup. Versions of this soup already existed (as I discovered when I went looking for recipes), but I somehow had overlooked it. I don’t remember what recipe I used when I first prepared the soup. It’s likely that I combined bits and pieces of several, as is typical for me. But I soon evolved a recipe of my own. This recipe serves a crowd. It will make between 4 and 5 quarts, depending on whether you like a thick or thin soup. And it freezes well, so leftovers won’t go to waste. First, you need to cook the black-eyed peas with smoked pork. Recipes often call for presoaking legumes. But if you soak black-eyed peas, they can cook in about 30 minutes — not long enough to develop a tasty pork broth. So I don’t soak them, which means cooking time of an hour and a half to two hours — and a superior broth. Since this is a soup, the broth is important. Second, you need to sauté/braise the collard greens. You should do this when the black-eyed peas are nearly done. This step will require 10 or so minutes, and then you’ll combine the greens with the cooked blacked-peas to finish the dish. Although there are quite a few steps to this recipe, the preparation isn’t difficult. Read through the steps a time or two and you’ll discover it’s a straightforward dish to prepare. After black-eyed peas have cooked for about an hour, test to see how they’re progressing. They should be on their way to becoming soft, but will probably still be somewhat firm. Now is the time to begin work on the collard greens. Wash collard greens. Cut out overly large/woody stems. Warm large pot (see first note) on medium. When pot is hot, add oil, then add onion and garlic. Season with salt and pepper. When soft (about 5 minutes) add red pepper flakes. Stir 15 or 20 seconds (to flavor oil). Add chopped collard greens. Sauté for a minute, stirring to incorporate onion mixture with greens, then cover pot. Turn heat to medium-low. Braise collard greens for about 10 minutes (longer if you prefer them very well cooked). Meanwhile, remove ham hock(s) from black-eyed peas. Allow to cool enough so you can handle them. When cooled enough to handle, remove skin and fat from ham hock(s). Bone, then cut remaining meat into bite-sized dices. 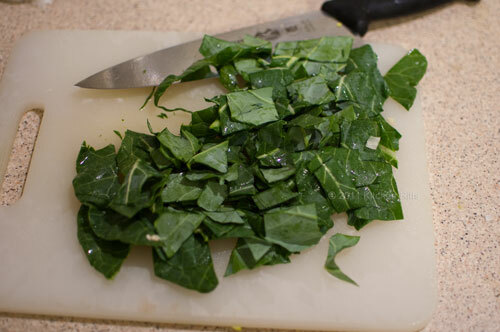 By now, the collard greens should have cooked 10 minutes or so. Notice the greens have been reduced in bulk by half or more. Taste a leaf to see how tender it’s getting. If it’s not done to your taste, cook a few minutes more. Next, add the chopped meat to the collard greens. If using, add the optional rice at this point. Check the consistency of the soup. Too thick? Add some water. After adding water (if necessary) check the flavor of the broth. If you want a meatier flavor, add ham base (1 to 3 teaspoons should be enough) and cook for another ten minutes. If not adding water or ham base, cook for at least 5 minutes anyway to ensure that the flavors from the black-eyed peas and collard greens blend together. You will end up with 4 or 5 quarts of soup, so you’ll need a pot big enough to hold this amount. I usually prepare the collard greens in a 6-quart Dutch oven, and then add the black-eyed peas to that. So I can get away with a 4 or 5 quart pot for cooking the beans. But if it’s easier for you to add the greens to the peas, obviously you’ll need a bigger pot when you cook the black-eyed peas. If you wish, you can prepare the black-eyed peas ahead of time (through step 6). Remove and discard onion, remove and reserve ham hock, and cool and refrigerate the peas in their cooking liquid. Then later, when you’re ready to prepare the soup, continue with step 7. In step 12, we add hot red pepper flakes to the onion and garlic and sauté them for 15 to 20 seconds (longer risks scorching the pepper, which makes it bitter). The goal here is to incorporate the flavor of the pepper flakes into the oil. By flavoring the oil, we’ll be able to better spread and incorporate the flavor of the pepper flakes throughout the soup. Many supermarkets carry stock base (chicken, beef, ham, etc) in their soup sections. I prefer the “Better than Bouillon” brand. If your supermarket doesn’t have it, ask them to stock it! You can also find stock bases online. Amazon carries Better than Bouillon, although the shipping is expensive. Penzeys Spices has their house brand, which is good. Stock bases taste far better than most canned stocks and all bouillon cubes. Plus, they’re more convenient (use as much or as little as you need). And they last a long time in the refrigerator after they’ve been opened. Ham base is very optional in this recipe, however so don’t worry if you can’t find it. The broth usually is sufficiently flavorful without enhancement. If you have leftover ham on hand, it’s a nice addition to this soup. Don’t overdo it, though. The meat is an accent to the soup, not the dominate flavor. You could also substitute ham for the ham hocks. In that case you will need to use ham base. Add some (about 1 ½ tablespoons) after the black-eyed peas come to a simmer. Add diced ham at step 19. 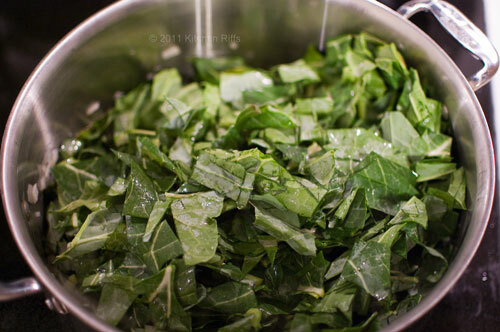 Timing when to begin cooking the collard greens is somewhat flexible and is partially a judgment call. You want to make sure the black-eyed peas are tender before you add the collard greens, so you don’t want to prepare the greens too early. Overcooking the peas usually isn’t a problem (though you don’t want to turn them into mush), so if you want to wait to prepare the collards until the black-eyed peas are just about done, that is OK. Once you combine the black-eyed peas and collard greens, you can also simmer the soup for quite a while without losing much flavor or texture. This is handy if you’re not quite sure when you’re going to eat (maybe you’re planning to serve the soup as Super Bowl halftime fare, for example). I usually add the optional cooked rice to this dish, but it also tastes great if you leave the rice out. If you prefer, you can use more or less rice than the recipe calls for. Alternatively, you can use another grain. I haven’t tried either cooked barley or quinoa, but I imagine either would be a pleasing addition. You can freeze the leftover soup. When reheating, try adding diced canned tomatoes for a new taste dimension. Black-eyed peas and collard greens are nutritional powerhouses. They’re chock-full of fiber, vitamins, and all sorts of worthy things. When we were younger, that may have been reason to view them with suspicion! But we’ve moved beyond that now. I think. Health benefits aside, this recipe just tastes so darn good. It’s also a perfect one-dish meal. It’s warming in cold weather. And, considering how much food the recipe yields, it’s cheap! So, let’s see. This soup can make us healthy. It doesn’t cost much, so it can save us money, which over time will make us wealthy (yeah, yeah). So we’re wise to make it. Right? Well, the last part is undoubtedly true. You're welcome! And thanks for commenting. Just bought collard greens for the first time. Looking for a soup recipe to use them in among the sea of recipes on the internet and I think this one sounds the best AND has the best instructions of them all. Can't wait to try it! Thank you!! Hi amanyk, collard greens are good! And you'll love them in this recipe -- it's a good one. :-) Thanks for the comment.